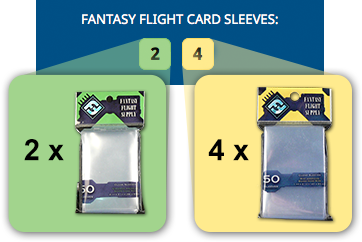 With Fantasy Flight Supply sleeves, you will see a significant reduction in wear on your gaming cards, thus keeping them in prime condition through many plays. In addition, Fantasy Flight Supply also provides a wide array of tokens, dice, and other gaming accessories specifically designed with your gaming needs in mind. This short introduction to the Fantasy Flight Supply line will help you learn more about which sleeves will be best for your games, which tokens might add some flare to your own game projects, and what dice you’ll need to get your gaming sessions rolling. Don’t forget to visit the support section for more information about sleeve sizes and additional product details. Whether you’re looking to protect the cards from your favorite board game or preparing your optimal LCG® deck for a big tournament, Fantasy Flight Supply has you covered. With four different sizes of board game card sleeves, and an assortment of colors and art styles for your LCG sleeves, there’s definitely a sleeve for all occasions! Board game cards come in a variety of sizes accommodating cards for the United States and Europe. Available in five different sizes, Fantasy Flight Supply board game sleeve packs are color-coded so that when you go to the game store to buy sleeves, you can easily identify the sleeves you need. All sleeves in the Fantasy Flight Supply board game sleeve line are made of clear, 100 micron-thick, non-PVC, acid-free polypropylene plastic. This means that the sleeves are durable, difficult to tear or crease, and free of chemicals that will corrode the cards within the sleeves. The sleeves are also designed to fit cards snugly, to make shuffling and handling easy. Each pack of sleeves includes fifty sleeves.Visit the support section for more information on sleeve sizing and download our Sleeving Guide that will tell you which sleeves fit which which games. Most gamers agree: you can never have enough dice. With hundreds of applications, dice are a universal staple for any gamer’s collection. Fantasy Flight Supply also carries a variety of dice for whatever situation you might need to roll for. The Roleplay Dice packs come complete with the six basic dice required for most roleplaying systems. Six-sided Dice and Ten-sided Dice are also available, each in packs of six. For tabletop commanders, the Wargame Dice pack includes ten six-sided dice in two different colors, perfect for waging war around the world. Looking to add some quality components to your own game designs? Want some colored tokens more durable than cardboard? You’ve found your source with Fantasy Flight Supply tokens. Gaming Tokens come in packs of twenty and are available in five different colors. These round tokens are stackable and are great for tracking various different effects in games. Are your heart tokens in Arkham Horror or Descent: Journeys in the Dark not cutting it? Replace them with your own tokens in the colors of your choosing. Wooden Tokens are also available for players looking to expand their collection with a variety of shapes. These packs of fifty include cubes, buildings, roads, pawns, discs, and more, available in six different colors. Fantasy Flight Supply is committed to providing you the best materials to protect, customize, and enhance your games. Stay up-to-date on all the exciting new Fantasy Flight Supply products by regularly checking our website. With many materials available, and many more on the way, Fantasy Flight Supply is your number one source for all your gaming needs! This document lists current FFG games, what kind of board game sleeves they use, and how many packs of each kind you will need to completely sleeve a copy of that game. This list is periodically updated to take into account new games that FFG releases. You can also find information on necessary sleeves in a product listing. Games are listed alphabetically on the information sheet. Expansions will be listed beneath core games. Find your game on the list and note the colored dots and numbers in the same row as your game. The dots indicate which sleeves you will need (For example, Red = Mini European Size) and the numbers inside the dots indicate how many packs you will need, rounded to the nearest whole pack. Each pack contains 50 sleeves. Last update: 2/28/10. Added Anima: Twilight of the Gods, Battles of Westeros: Lords of the River, Battlestar Galactica: Exodus Expansion, Cosmic Conflict, Lord of the Rings: The Card Game Core Set, Magnifico, Tide of Iron: Fury of the Bear. In print runs of A Game of Thrones: The Board Game labeled "Made in Germany", the cards are Standard Euro-sized (59x92mm). Current print runs of A Game of Thrones ("Made in China") use Standard American-sized cards. For more information, contact us at [email protected]. Card and Component List for Warhammer Fantasy Roleplay (PDF, 1.1 MB) This document contains the complete list of cards and components, including quantities of sleeves needed to completely protect your Warhammer Fantasy Roleplay products. Sleeve measurements are for the size of the card, not the sleeve itself. As shown in the illustration above, the card from Red November measures 1 5/8" inches on its short side and 2 1/2" inches on its long side. This card therefore fits in a Mini American sleeve. Once you have the measurement of your cards, refer to the chart below to find the type of sleeve you need. Sleeve measurements are given in inches and millimeters. Each pack of sleeves are color-coded so that when you go into your local retailer to purchase board game sleeves, you can be sure you've chosen the right kind. Another way you can determine what kind of sleeves you need is to compare your cards to games you already own. Retailers and Distributors: This informational flyer provides all of the basic information about Board Game Sleeves and Art Sleeves to help your customers make informed purchases of Fantasy Flight Supply products. Feel free to copy and distribute this flyer. Twilight Imperium, Descent: Journeys in the Dark, Arkham Horror, Midnight, and Red November are © and ™ and/or ® Fantasy Flight Publishing, Inc. Lord of the Rings LCG, Call of Cthulhu LCG, A Game of Thrones LCG and DungeonQuest are © Fantasy Flight Publishing, Inc. Living Card Game, LCG and LCG logo are ® of Fantasy Flight Publishing, Inc. The Lord of the Rings is ™ The Saul Zaentz Co. d/b/a Middle-Earth Enterprises. Call of Cthulhu is ™ Chaosium, Inc. A Game of Thrones is ™ George R.R. Martin. DungeonQuest is ™ Scanditoy AB. Pandemic is ™ Z-Man Games. Warhammer: Invasion LCG is © and ™ and/or ® Games Workshop, Ltd. Star Wars is © and ™ and/or ® Lucasfilm, Ltd. Fantasy Flight Supply is a trademark of Fantasy Flight Publishing, Inc.